The Republic of Palau is a small island nation with remarkable tourism experiences, and the world is taking notice. Palau is a magnet for divers searching for the some of the world’s best conditions, and boasts many more natural wonders like the astounding Jellyfish Lake, Milky Way lagoon and the Rock Islands Southern Lagoon. The destination’s “pristine paradise” brand portrays the islands as an environmental gem waiting to be explored. Can it maintain those quality experiences as visitation increases? To that end, Palau has taken steps to walk its talk and think about its destination identity. For example, the national government created an enormous Pacific marine sanctuary in 2015 to help maintain biodiversity in the region and limit ecological damage caused by overfishing. We spoke with Nanae Singeo, Managing Director at Palau Visitors Authority, at Destination Think! 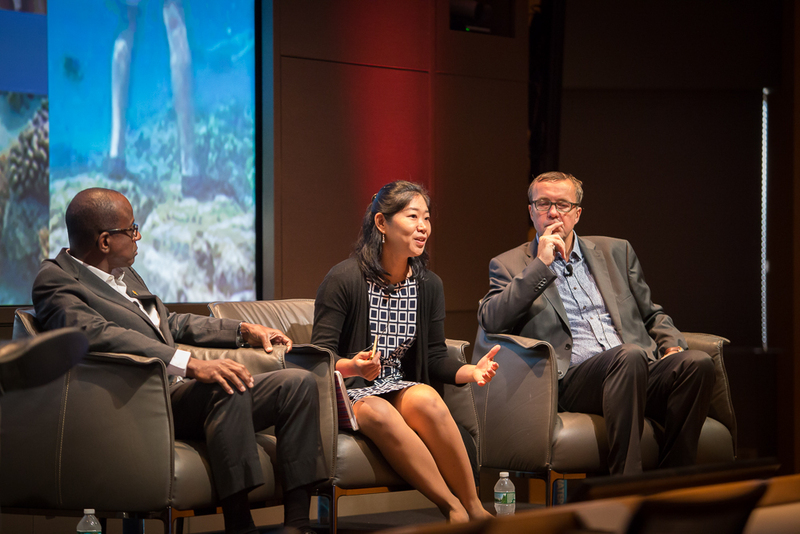 Forum 2016 in New York City, where she participated in the Profit and Planet panel discussion. Originally from Japan, Singeo now resides in Palau, where she leads a new destination management plan that taps into the nation’s cultural identity. Here, she describes Palau’s strategic vision for tourism and the challenges that lie ahead. Destination Think! : Can you describe Palau’s most compelling tourism product and why it’s important to focus on sustainability? Nanae Singeo: There are two primary segments, one being diving – that’s what Palau is known for. And then there’s the conservation effort, and they go hand in hand. But we are trying to market a destination holistically, where it’s not just about diving or marine products, it’s not just about conservation, because one of the compelling reasons we have such great diving is because the divers protect and manage the reefs. That’s been a traditional custom and wisdom and that’s what makes Palau so unique and different. Ocean management has been in the community’s mandate, going back generations and generations. As a foreigner, I find it so intriguing and compelling. Anything like that should be shared, and that makes Palau feel special. Our President travels to speak at different international conferences and he’s known to be a global leader of conservation because of the local traditions of ocean and environmental management. So he would just talk about his culture, and that already became a product. Sustainability so important here, because it’s their lifeline, it’s their culture. So unless we can protect and embrace that, there’s no more Palau. The people need the environment for their customary practices, and were taught to conserve it. How do you incorporate that culture into your destination’s strategy? Our branding is all about “Pristine Paradise. Palau”. “Pristine” really speaks about our natural environment as well as the culture. Palau is just so naturally beautiful to begin with, but the people are also very naturally hospitable. And the benefit of this is that we have “paradise.” Our products or experiences all go back to the branding, the promise. We use a checklist: Is this pristine? Check! Is this paradise? Check! And most importantly, is this Palau? Check! So it really has to be an authentic experience. That’s how we try to protect the brand as well as how we try to deliver. Can you describe today’s visitation patterns and how that impacts the visitor experience? Palau is a very small island nation, so capacity has been one of our challenges, along with management and how to communicate about them. I think it’s really important that we know our limitations and our capacity. We’re also identifying more appropriate or meaningful ways to convey our message, not necessarily to explain the “dos and don’ts,” but instead, “Here’s how we like to communicate to protect the environment and to protect the culture.” We’re working on that particular campaign right now. What criteria do you use to determine Palau’s visitation capacity? There’s no single answer to that question, to be honest. There have been a lot of internal discussions about what that means for us and there are many factors. Could it be a number? Or could it relate to emotional issues? As in, “I feel too crowded.” Or could it be scientific proof that coral is being damaged by the number of visitors? There are many ways to identify what capacity means, so we’re taking a holistic path including the socio-economic impact, and this work is being done at the moment. It’s a continuous effort, and we’re trying to consider the visitor point of view as well as the residents’. Is it too crowded for them? We’re learning that the physical comfort zone component is different from culture to culture. Some people feel they need more space, while others are okay with sitting next to each other. How does the capacity issue affect your management plan for Palau? First, we want to first identify what the capacity would be. What is the right number of visitors? The other element is about involving the community members so that they are aware of what the expectations are from the visitor’s point of view, and vice-versa. We also need to convey the cultural context to our visitors. Ocean management, land management and erosion control, the so-called “ridge to reef,” are very important to the culture of Palau, so when you visit here, there are things we expect you to understand. The whole communication piece is a part of the management. We’re also looking into the financial elements. Protection fees and “green” fees and other fees are being implemented at the moment. But what is the right distribution of these particular taxes? How do we reinvest into another element of destination management? In the Profit and Planet panel discussion at Destination Think! Forum, you mentioned that Palau Visitors Authority has a budget of less than 1% of the government budget, while 70% of Palau’s GDP is related to tourism. Do you have any advice for other destinations who work with small budgets? First of all, a bigger budget always makes your life easier, but I think what we’re trying to do, first and foremost, is to figure out how creative and strategic we can be to get our work done and get our messages across. The other thing I would do is to develop partnerships. Palau is such a small, but very special country. We have really been blessed to get a lot of international recognition and support. There are some grants available to Palau as a developing nation. That’s one of our biggest sources of support. We get a lot of support from different NGOs (non-governmental organizations), as well as media, because they understand how important our initiative is. For example, we work with National Geographic. They come here to film, so we get that support from their end and we try to use the footage they produce. We may not have the budget to do everything, but we do a lot of lobbying through different organizations to really have them support us – this works almost like an in-kind contribution. Sustainability and climate change is important to business today and the tourism industry has certainly started to recognize it. The UNWTO has declared that 2017 is the International Year of Sustainable Tourism for Development. The marriage between tourism and sustainability is starting to happen.